Toyota Celica 1.8 VVTi [ZZT230] 11/99-07/02 Performance Sport Drilled and Grooved Front and Rear Brake Discs plus Pads. Front Discs Specification: Vented - Studs 5 Disc diameter 255.0mm Disk thickness 25.0mm Overall height 49.3mm Centre diameter 55.0mm Minimum thickness 23.0mm. Rear Discs Specification: Solid - Studs 5 Disc diameter 269.0mm Disc thickness 9.0mm Overall height 56.0mm Centre diameter 55.0mm Minimum thickness 7.5mm. Some models can have a 275mm front disc option please check before you order. Front and Rear Mintex Pads. If your fitment is not listed, check our other items in our shop. During checkout please include a current telephone in case we need to contact you. Straight swap for your old standard discs! Best results will be seen with premium branded pads, although these discs are fully compatible with budget pad types. We can also supply Mintex Redbox pads. Motorsport Tunning & Engineering Company established in 2004. We are a UK based company that specialise in the manufacturing and supply of performance brake discs andbrake pads. Our discs are machined using state of the art CNC machines which ensure all designs are cut with precision. IV, HS, KA27-28, KW, PA20-49, PA60-78, PH17-26, PH30-44, PH49-50, ZE, TR21-25. 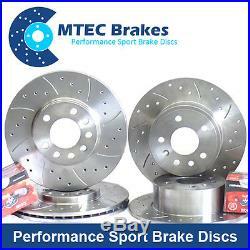 The item "Toyota Celica 1.8 VVTi 99-02 Front Rear Brake Discs and Minex Pads" is in sale since Thursday, October 27, 2011. This item is in the category "Vehicle Parts & Accessories\Car Parts\Brakes & Brake Parts\Brake Discs". The seller is "mtec100" and is located in UK. This item can be shipped worldwide.